This document describes the CellarTracker bulk import facility and how it can be used to migrate existing wine inventory information stored in spreadsheet, database or other cellar management applications. Customers who have used the bulk import facility have found that it generally speeds up the process by a factor of 10-15 as compared to manually entering a cellar on the site. That said collectors with large cellars should still expect to spend at least a few hours. We sincerely believe you will find the effort to be well worth your time! Please familiarize yourself with the high-level overview of the import process. Please make sure to create a CellarTracker account. Prepare your spreadsheet or text file so that it is clean and consistent. Please try to avoid common errors. We recommend using our provided import template, if possible (there is one templates for inventory, consumed bottles and tasting notes). Mail your spreadsheet(s) to support@cellartracker.com. If you are mailing from a different address than you used to register on the site, please include your username (we do NOT need your password). Also, if you have previously entered information into your CellarTracker cellar, please let us know if it should be wiped before the import is processed. Finally, please be patient while waiting for us to do initial processing of your data, as this can sometimes take a day or two. The cleaner your information is, the more quickly we can process it. In contrast, custom spreadsheets or spreadsheets with inconsistent data can take hours to cleanup. There are three phases of the import. The first and last are largely handled by CellarTracker administrator(s), and the middle phase is the responsibility of the user. In this first phase of the process, you supply a spreadsheet (Microsoft Excel), database (Microsoft Access) or text file (any CSV or tab delimited text should work). There may be some iteration as CellarTracker administrators work with you to de-stem the content (a.k.a. determine what each column contains and the best way to import the specific content into CellarTracker while retaining the original meaning). Once this iteration is done, the crush will ensue as a CellarTracker administrator will import this into the database and match up the columns with the standard naming conventions. This phase is largely in your control. The fermenter is a holding tank of sorts for your cellar data and wine descriptions. CellarTracker provides simple tools to help you search the CellarTracker database for wines that match your descriptions so that you can confirm the mapping for each unique wine. While a bit tedious, this process is crucial to maintain the overall integrity of the CellarTracker wine database, and it is necessitated by the fact that nearly everyone, left to their own devices, describes the same wine in subtly different ways. If you have multiple vintages of the same wine you only have to map one vintage to import them all. This process starts with an automated pre-mapping where typically 25-40% of your wines can be automatically mapped to their CellarTracker counterparts. For these pre-mapped wines, you merely need to review them and confirm the validity of the mappings. For the unmapped wines, you use the mapping tools to prepare your data for import to the right wines. When you are done mapping wines (or at any point during the fermenting process when you want to take a breather), you can click the button to IMPORT the wines you have mapped. At this point, bulk content with mapped wines is marked as completed, and the actual bottles and/or tasting notes are created in your CellarTracker cellar. Any unmapped wines remain in the fermenter for you to continue mapping, and you do not need to do anything special to save your progress. Now that we have described the process in somewhat superficial detail, here is a more detailed explanation with some screenshots from the site. If you find yourself at all confused during the import process, this section should be helpful in clarifying things for you. The real challenge with import stems from the way that CellarTracker is built. At the core of a site is a database of wines that is centrally maintained and shared across all users. So if 10,000 users share the 1989 Lynch Bages, ideally all of their information is 'hanging' from that same record in the database. This allows everyone to easily see tasting notes and drinking window recommendations from the rest of the community. Duplicates and errors do appear, but we constantly look to merge wines and fix inaccuracies. Given this, bulk import presents a unique challenge, as collectors catalog their wines in a variety of ways, using subtly different names, storing different information, etc. The bulk import tools are designed to overcome this challenge while at the same time making it easy for people to import information about hundreds or even thousands of bottles in just a few hours. There is now one flavor of bulk import spreadsheet to let you import both inventory (bottles, purchases etc.) and consumption history (when consumed or sold, how much received, tasting notes and personal scores, etc.). Currently the bulk import tools support the following columns of information. All columns are optional except for Vintage, UserWine1, Quantity and BottleSize. The same wine can have multiple rows in a spreadsheet if, for example, you choose to track separate purchases of the same wine, different bottle sizes, each bottle in a separate location/bin etc. Bottle State The default is "1" which means the bottle is in-stock. You use "0" for consumed bottles and "-1" for bottles that are still pending delivery. Vintage The year the grapes were grown. Non-vintage wines use an underlying value of 1001, but we can handle NV, N/V are various other combinations. 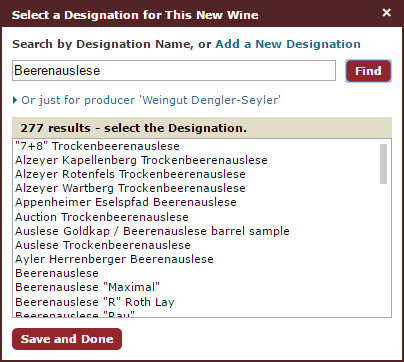 UserWine1 – UserWine8 Users can import up to 8 different fields describing the NAME of the wine. Typically these include the name of the producer, the varietal, proprietary names, appellations, country, wine color and type etc. Please note that these fields are not imported, but rather they are concatenated together to help you search for a matching wine in CellarTracker. Only UserWine1 is required. Please do NOT fill the UserWine fields with other data you wish to import. Instead you need to use one of the other fields. Quantity & Bottle Size Self explanatory. If you have multiple bottles of the same wine, as mentioned previously, these can be spread across multiple lines. Each row needs to be self-contained and stand alone. Storage Location & Bin The system lets you use two 40 character fields to describe where the wine is stored. Current Value An estimate for the current worth of the wine. All values must be in the same currency. Begin & End Drinking This lets you specify the beginning and ending years targeted for drinking. Store The name of the store or supplier of a wine. Purchase & Delivery Dates When a wine was purchased and the estimated or actual date of delivery if different from the purchase date. Cost & Currency The per-bottle price paid for the wine. The currency is assumed to be the default for your account, but you can specify a 3-letter code if the currency differs from your default. If you have purchases in multiple currencies, usemultiple row to represent each purchase. Bottle Note You can add a 255-character bottle note (attached privately to each bottle). Purchase Note You can add a 255-character purchase note (attached privately to each purchase). Private Note You can store one private note per-wine, a long text field (6,144 characters) that is useful for storing all sorts of information. Consumption Date For all of the consumption fields, the bottle state needs to be 0 for this to be imported. The date when you consumed a bottle, and if skipped the date of import is used. Consumption Type The default is "Drank from my cellar"
Consumption Note A private 512-character consumption note. Consumption revenue & currency If you sell a bottle (or return it to a wine store), this lets you track the per-bottle amount received. You can override the currency. Public tasting note & rating If you have your own notes based on your tasting of a wine, you can create a public tasting note. You can also post a score on the 100-point scale (which is 50-100) or fill out a "1" in the Defective column if the wine was corked, oxidized, defective etc. Review Scores For each of the Wine Advocate, Wine Spectator, and Wine Enthusiast, the site allows you to import a score as well as year values for begin and end drinking windows). You can also import up to 6144 characters of review text per review. Many people maintain spreadsheets for their wine inventory, but in reviewing quite a few we have come to see some standard errors that require cleanup before they can be imported. Muddled bottle sizes: Often times, people will not have a separate bottle size column but rather demarcate some aspect of the wine name to include "(magnum)" or some other size descriptor. Ultimately, this data has to be culled out to a separate column of information. 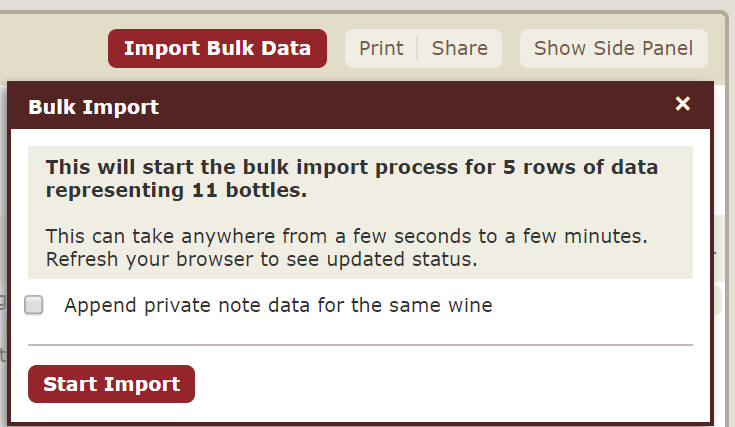 Also, for mapping purposes, a 1.5L and 750ml bottle of the same wine will be mapped to the same wine in CellarTracker. If these are described differently in the spreadsheet, they each need to be mapped. Combined reviews: This is probably the most common error. People will often have one "Score" column and a separate "Source" column to indicate if the score was from the Wine Advocate, Wine Spectator, etc. For purposes of bulk import, these scores need to be in separate columns that are clearly dedicated to a specific publication. Extra rows: People often seem to break their spreadsheets into separate sections based on region or other classifications. They will have a few rows in between with counts of bottles, etc. For purposes of bulk import, these intermediary rows need to be deleted to create a regular grid. Irregular use of columns: Sometimes people use a spreadsheet as a somewhat freeform grid, laying things out visually. These sheets require the most work to clean up. Muddled bins/locations: CellarTracker allows you to demarcate bins and/or locations for every single bottle in your collection. These however need to appear in separate rows of your spreadsheet rather than having comma separated lists or things like "Cellar (2 bottles); Offsite (3 bottles)". Repeat: these need to be in separate rows with quantities matching the location. Bulk import itself happens using the Data Transformation Services of Microsoft SQL Server. As such, accepted formats include Microsoft Excel, Microsoft Access, and various text formats (tab-delimited, comma-separated, etc.). If you store data in other tools, you will need to use their export facilities to generate any of the above formats. In extreme cases, we have accepted tables in Microsoft Word or HTML (which can be easily copied and pasted into Microsoft Excel for subsequent massaging). This phase is largely in your control. The fermenter is a holding tank of sorts for your cellar data and wine descriptions. CellarTracker provides simple tools to help you search the CellarTracker database for wines that match your descriptions so that you can confirm the mapping for each unique wine. While a bit tedious, this process is crucial to maintain the overall integrity of the CellarTracker wine database, and it is necessitated by the fact that nearly everyone, left to their own devices, describes the same wine in subtly different ways. If you have multiple vintages of the same wine you only have to map one vintage to import them all. This process starts with an automated pre-mapping where typically 25-40% of your wines can be automatically mapped to their CellarTracker counterparts. For these pre-mapped wines, you merely need to review them and confirm the validity of the mappings. For the unmapped wines, you use the mapping tools to prepare your data for import to the right wines. If you have multiple vintages of the same wine you only have to map one vintage to import them all. Invalid or non-date values for purchase dates or drinking windows. End drinking windows dates that occur before beginning dates. Non-numeric values for vintages or quantities. Non-currency values for price or valuation. Prices or values that are based on lots instead of per-bottle. Any wines with errors will show an indicator that it needs to be fixed; click the Need to FIX link to edit the entry. For example, the row below has a typo of 202 instead of 2020 for the end window. This is the core of the process. For each unique wine name employed in your cellar, you need to establish a mapping to the same wine in the CellarTracker database. 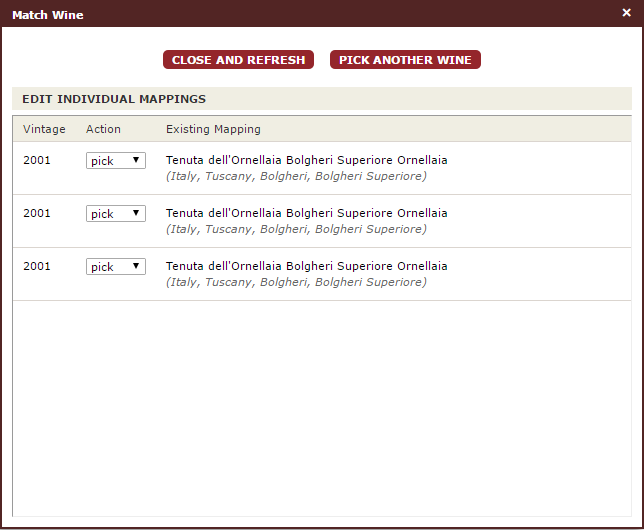 For an individual wine you simply click the Map button as shown below. 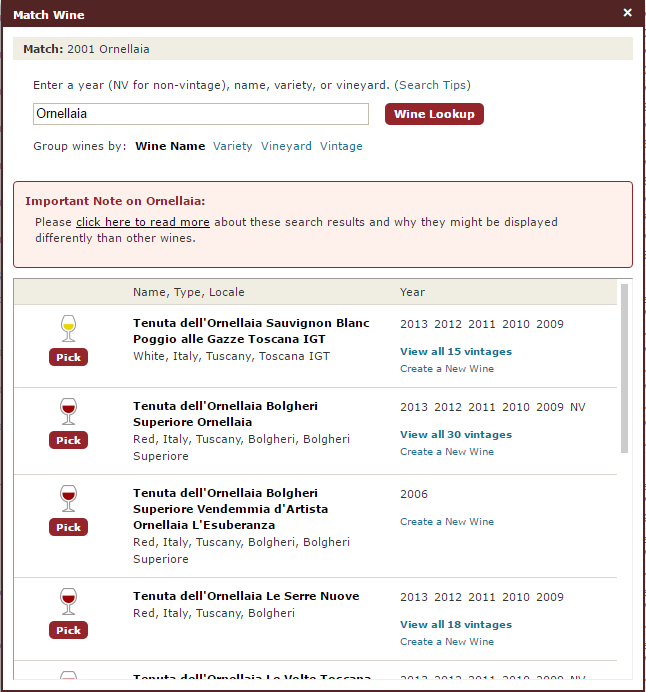 That brings up the following dialog with a search based on the user wine name fields. Click the Pick button next to the correct wine; in this case, it is the second one in the list. That takes you to the following dialog, which lists all bottles of the same wine in your spreadsheet. If the mapping is correct, click Close and Refresh. Otherwise, choose Pick Another Wine to search again. The process is even more efficient if you choose to summarize by wine name, since then you can more clearly just establish one mapping to cover many vintages of the same wine. Clicking Map will open the same dialog as above where you can search for and pick the correct match. Generally we find that 95-99% of the wines in a collector's cellar are already represented in the CellarTracker database. In the remaining cases, you will need to create new wines instead of mapping to existing ones. Let's look at an example using this German Riesling; when clicking the Map button, the default search term is not yielding any results. In this situation, the best thing is to adjust the search term to cast the net more widely by removing extraneous words from the title or paring back to just a producer name. Sometimes, typos in words can be hard to spot; be sure to double check the spelling of your terms! In our example above, we'll pare down the search term to just "Dengler Seyler Maikammer Heiligenberg" which does return results. If it didn't, you could further adjust the term to just the producer name ("Dengler Seyler"), or even something similar from the region and type of wine ("Pfalz Riesling Beerenauslese"). When adding new wines to the database, the goal is to find an existing wine which is a close match to the one you want to add. 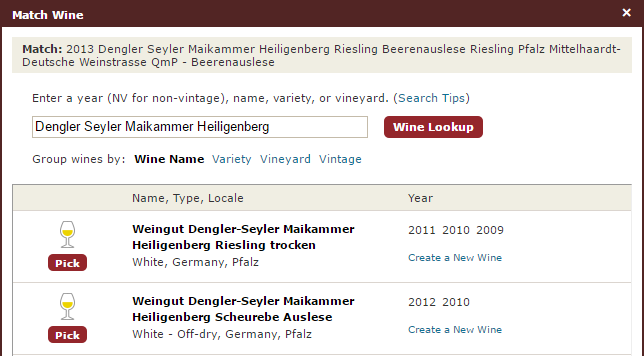 We recommend continuing to adjust the search term down to the bare minimum to confirm the wine does not already exist. If you've done this, the easiest way to create a new wine is to base it off of something similar from the same producer (or region). In the example above, the Auslese is the closest match to the Beerenauslese, so choose the Create a New Wine link underneath that to get started. That will open up a new browser window allowing you to add the new wine, and it will look like the following. The page will be pre-populated with the details of the existing wine we selected. You can update the various fields as necessary to create the new wine. In our example, we update the vintage to 2013, and change the designation to Beerenauslese. Click the Edit button (or the text itself) to open up a dialog allowing you to search for the appropriate value for that field. If you can't find the value, there's a link to Add a New [Field] at the top of the dialog; click it, and enter the value you want to add. 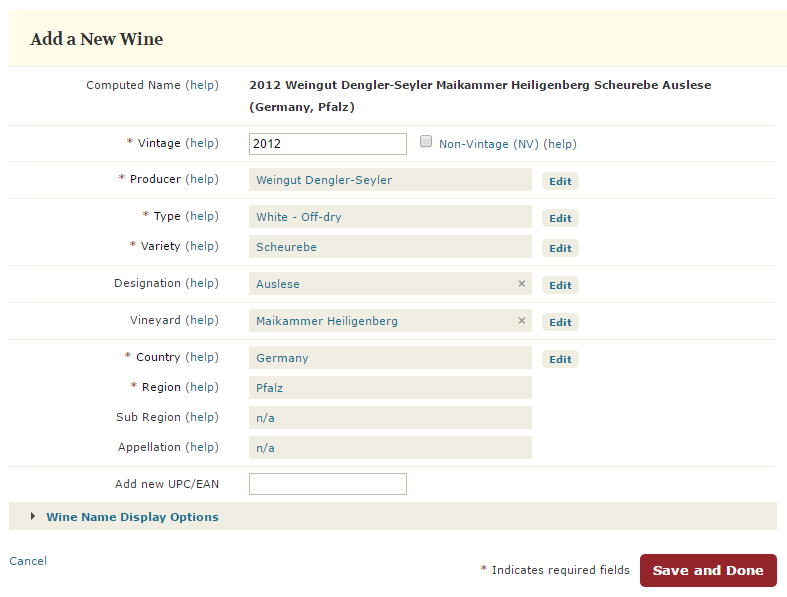 Once you've updated all of the fields and verified the wine appears correct, click Save and Done to create the wine. You can then close that browser window, and go back to the window where you were mapping. Hit Wine Lookup to re-do the search, and the new wine should now appear in the list. Click Pick to select it and complete the mapping. This process is most efficient when you are in the Summarize by Wine view, and map multiple vintages of a wine at once. Most collectors can map about 75-100 wine names per hour. For a cellar with 3,230 bottles, 793 actual wines and 452 unique wine names, it’s estimated that mapping will take from 4.5 to 6 hours. However, the pre-mapping phase would typically wipe out 1/3 of that estimate to make things even faster. When you are done mapping wines (or at any point during the fermenting process when you want to take a breather), you can click the Import button to import the wines you have mapped. If any mapped wines have FIX indicators (as described above) these need to be fixed before the entire import can proceed. If you have existing wines in your cellar, you need to let us know if these should remain or if they are test wines which you would prefer to be cleared out. Or you have the power to clear out your cellar. What if I already started to enter my cellar manually? That is no problem. Bulk imported data can be applied to an existing cellar. However, if your spreadsheet is the master reference (and is duplicative with information entered into CellarTracker already), you should request to have your current CellarTracker inventory wiped before the fermented content is bottled. Right now there is no charge for the bulk import service, although this may change if it proves to be too labor intensive. CellarTracker itself is free, but users are encouraged to make annual, voluntary payments. $40/year is the suggested contribution for users with fewer than 500 bottles in their cellar, $80/year for users with 500 to 999 bottles, and $160/year for users with 1,000 or more bottles. We sincerely hope that any user who successfully employs the bulk import service at least pay the requested amount for one year. That is a function of the size of your cellar and the number of unique wines (ignoring vintage variation). We have generally found that users can map 75-100 unique wines per hour, and the typical 1,000 bottle collection has 200-300 unique wines. What formats can you import? What about wine futures (pending orders)? Absolutely. Just mark the BottleState column as Pending (-1 internally), and the wine is created as pending delivery instead of being added directly to your cellar. This allows you to use a standard CellarTracker feature which lets you closely track your 'futures' and 'pre-order' purchases. Absolutely, just fill out the template.